You'll also love this week's photos on the topic of Consistent and Loving Care over at Natural Parents Network, showing how alternate caregivers can provide the support and attachment our little ones need. Looks like it is very comfortable as well! Great, it is possible! I love that you still carry him. With the twins I was put on bedrest pretty early on (we had ttts) so I didnt get to carry my youngest girl nearly as long as I would have liked. The pictures are super cute. Sweet! Both bambinos are riding in style. 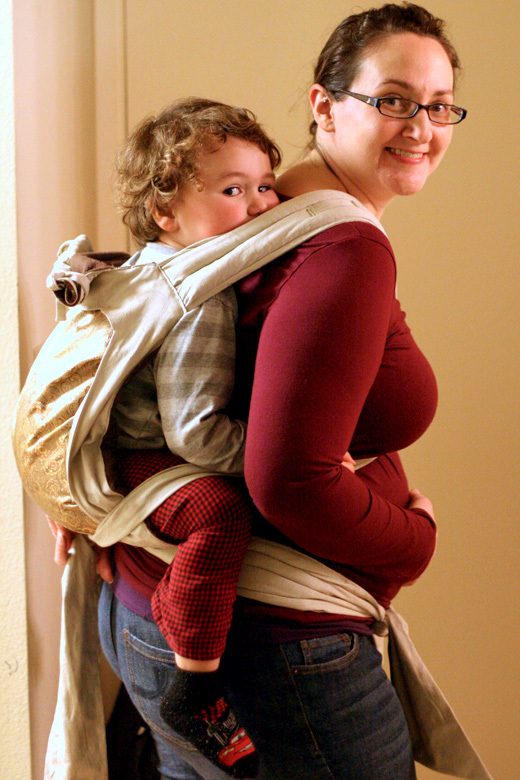 I am super impressed that you made that carrier AND that you are using it while pregnant. With a 44-pound child! I am a wimp and stopped wearing Ivey in the Ergo around the time I started showing. She's only about 25 pounds. Please do post process photos of the mei tai! 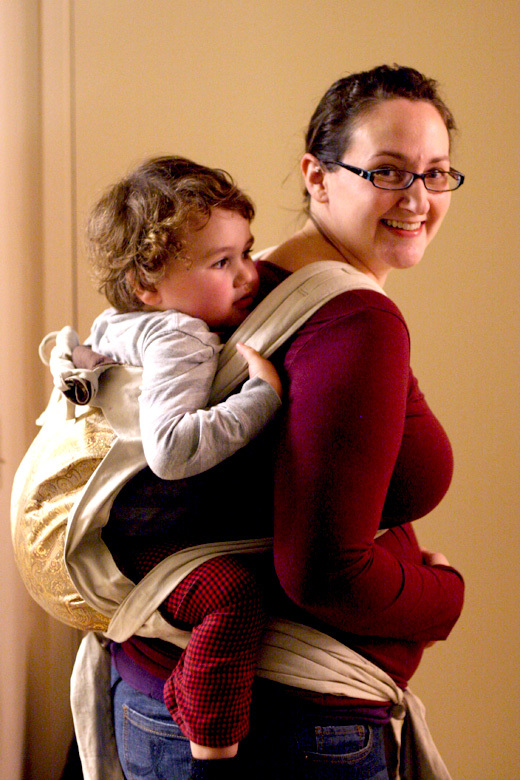 I'm starting to feel like maybe I'd like to make a carrier. Very cute. Love the shots of him with the hat and glasses. I am super impressed! I hate carrying my daughter (who's probably 25ish lbs) right now while pregnant and I miss it so much. I also miss being able to give her proper hugs and a good snuggle on the couch. 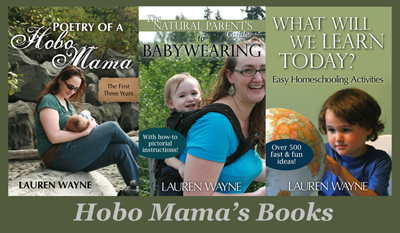 Looking forward to doing both in a few weeks with a new addition to our hugs and snuggles. You are such an awesome Mommy! 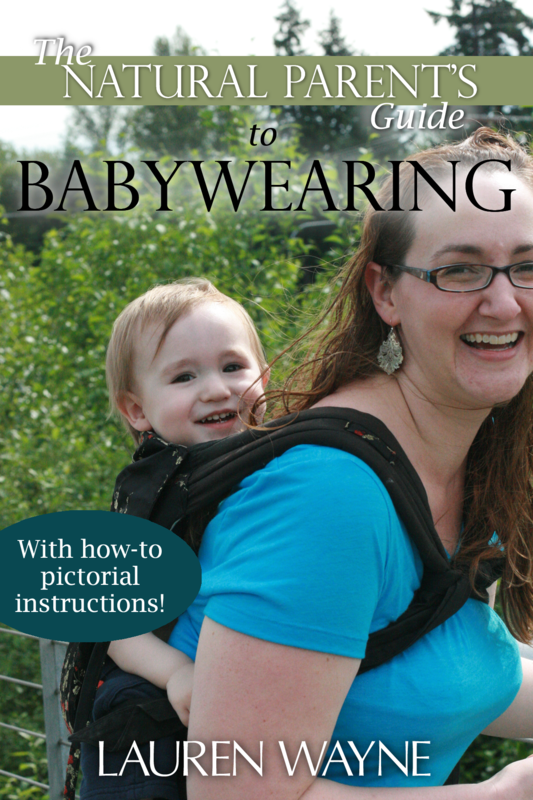 Do you think you'll manage to double-wear once the baby arrives (and you recuperate)? What a busy mama you are. Very cute! How far apart will they be?? Love it! Can't wait to see your progress photos for that mei tai. It looks great! Awesome new carrier! I wonder if I could convince my 14 year old to let me wear him just ONCE! Ha ha, then again!! Fab! 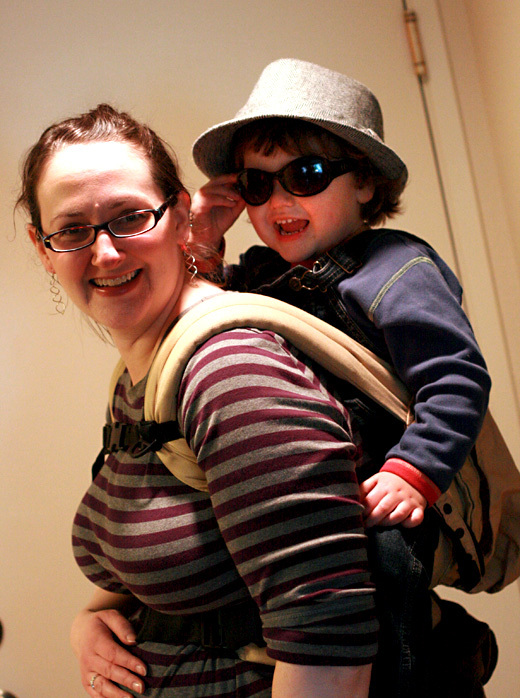 I was a pregnant babywearer too and it's great to see your photos - I only used my Ergo and my girl was younger and lighter than Mikko! I'm very impressed with you handmade Mei Tai and 44 lbs child! You both look great! Very cute! I never wore any of my kids while pregnant. I think it's so cute when I see other women doing it though. So does Mikko balance out the belly or does that just HURT? Great pictures! The Mei Tai looks great! Your mei tai looks great! I really liked using my mei tai during pregnancy, but found that I couldn't tie it under my belly, it make me have contractions. I just tied it above the bump. My baby was much lighter than your little guy-you are getting a work out! I remember wearing my then 2.5 yr old in my mei tai while I was in labour with our last baby!! Came to your blog through the extended breastfeeding carnival. Wow! I'm so impressed with your homemade mei tei! Looks very professional!! I keep meaning to take pics of me wearing my 2.5 yr old while pregnant... maybe this weekend! I know I need to do it soon because I'm not sure how much longer my baby will stay in utero!! Love that you made a mei tai! Wow! 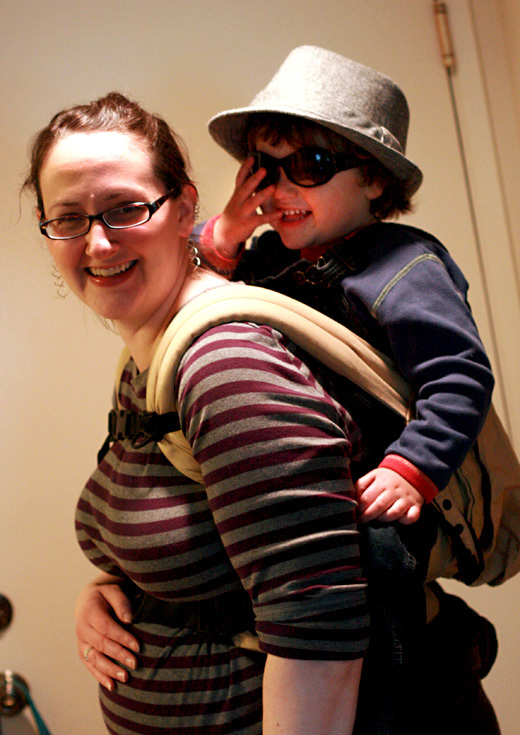 You guys look SO cute & I am very impressed, that's a lot of weight on your back while pregnant! 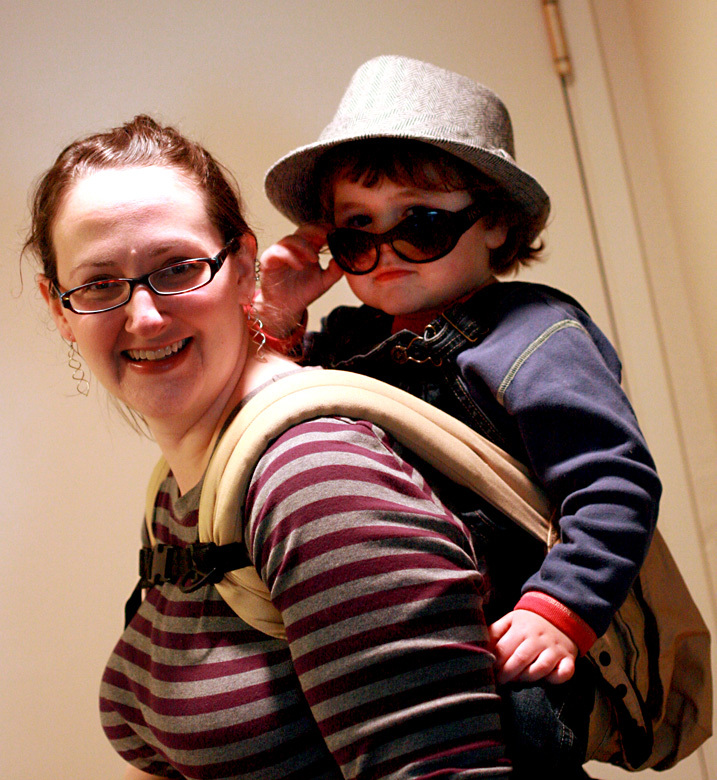 I stopped babywearing when I was pregnant too, mostly just because I was uncomfortable. I love your mei tai though - did you use a pattern or make it up as you went? I've never tried one but they look like the best of wraps & the ergo put together. You may want to look also for an Onbuhimo to make because that is so super comfortable when you are pregnant as there is no hip belt. I just made one a few weeks ago and although not pregnant I just love that thing. Aw I love it! I'm 5 months along and still wear my son on my back and people are always freaking out at me for it. And he's only 22 lbs! I'm not sure I could make it if he was twice that. Then again, when he grabs the mei tai and drags it over to me, it's kind of hard to say no.